The basic elements of trustworthiness are contained in the Trust Equation. T stands for trustworthiness—how much the buyer/client trusts the seller, or consultant. C stands for credibility—it speaks to words and credentials. R is reliability—how others perceive the consistency of our actions, and our actions’ connection with our words (integrity). I is intimacy—how secure or safe the client feels sharing with us. High numerator scores build trust: a high score in self-orientation destroys it. The pragmatic, field-oriented follow-on to the classic The Trusted Advisor. 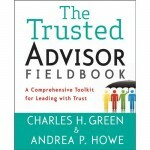 Green and Howe go deep into the how-to’s of trusted business relationships—loaded with stories, exercises, tips and tricks, and deeply practical advice. “Sales” and “Trust” rarely inhabit the same sentence. Customers fear being “sold” — they suspect sellers have only their own interests at heart. Is this a built-in conflict? Or can sellers serve buyers’ interests and their own as well? The solution is simple to state, hard to live—and totally worth the effort. This classic book explores the paradigm of trust through the filter of professional services. It is a blend of thought and practice, clear ideas and practical suggestions, and it has found a place on many professionals’ working bookshelves.